On April 25th, Saint Paul’s Outreach New Jersey hosted its annual Benefit Banquet. The night focused on celebrating the work the Lord is doing, has done, and will do on campuses across the county, like Seton Hall University and Rutgers University, "for generations to come." Isabelle Maina, SPO Missionary at Seton Hall, engages in conversation with a pedestrian, offering him a rosary and inviting him into the Cathedral. For Seton Hall Missionaries and students, New York City, the U.S.’s most populous and influential city, is just a train ride away. 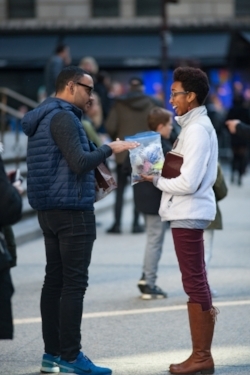 On March 26, 2018, three Seton Hall Missionaries traveled to NYC to participate in an afternoon of evangelization outside Saint Patrick’s Cathedral. At the Cathedral, confessions were being heard all day as it was “Reconciliation Monday” across the Diocese. SPO Missionaries along with religious brothers and sisters, businessmen, and other lay people teamed up to invite pedestrians to Jesus’s love and mercy through the sacrament of Confession. At Seton Hall University, midterms are well underway with the promise of spring break just around the corner. But this isn’t the first chance students will have gotten to get away from campus, from February 2nd to February 4th, SPO NJ hosted its annual Fan Into Flame retreat! This year’s Fan Into Flame was unique for a few reasons. First, and probably most importantly, the retreat was almost entirely student run! Our Emcees, senior Adam Wiernasz and junior Laura Guempel, were at the helm, supported by a leadership team comprised of over twenty students. Each year at Fan Into Flame, students are invited to enter into an intimate and personal relationship with Jesus Christ. The talks begin by introducing the retreatants to a very, very simple concept that is at the same time eternally complex and important. You ready? God loves you. As Junior Spencer Ochner put it in his Jesus is Lord talk, “Say it with me. God loves you.” With that in mind, students were led to experience how God’s love can be both experienced and also responded to. Students Elisa Maguigad, Gabe Natural, and Dan Folta offered students different perspective of the ways God can love us. After proclaiming the Truth of God’s love, Fan into Flame provides students with an opportunity to respond to that love. Graduate student Miguel-Lorenzo (Meeko) Natural, introduced students to a new way to respond: glorifying God through expressive praise. The retreat was rounded out by Senior Dave Miller, who explained how we, as a community of students, live out the Gospel every day on Seton Hall’s campus through outreach events, Thursday night campus ministry events, and our Household program, to name a few. God’s work was clearly evident by the time we began to pack up: student testimonies ranged from thankfulness about being given the opportunity to learn about God all the way to expressing a desire to become Catholic! The College of Communication and the Arts at Seton Hall University featured an article highlighting Paola Hegedus, a new full-time Missionary at Seton Hall. In December, Paola graduated with a degree in Graphic Design from Seton Hall University. This semester, she begins as a full time Missionary serving as the Women's Household Leader. For the second time in New Jersey’s history, St. Peter’s Young Adults, Rutgers Catholic Student Association, Seton Hall SPO, all the SPO NJ Missionaries, and Compass (the young adults of the People of Hope) gathered together for a formation retreat that included a three part talk series about wisdom called “OtherWise.” It was remarkable to see all of these groups (about 140 people in total) fill the St. Peter’s parish hall with joy and excitement for what the Lord had in store for the weekend. Joseph Matthias, a Servant of the Word based in Michigan, flew to New Jersey for the weekend to give some insight on wisdom through the Lord’s perspective. He taught the crowd that wisdom is what ought to be and therefore how we ought to live, that it applies knowledge to real life. This wisdom does not come from within ourselves, but from God, therefore we are not self-wise, but other-wise. This wisdom from God necessitates humility, confidence in God, and a relationship with Christ, who is the wisdom that constitutes the universe.Practically, Joseph taught the young adults that the wise life is a life of ordered habits, passions, and attitudes. A wise life is hopeful, driven by the desires of the Lord, and bring life interiorly and, in turn, to the world around us. At the close of the weekend, the retreatants had an opportunity to respond to all they learned in the context of a powerful prayer meeting. The Holy Spirit was very present, and came forth through worship, inspired words from many of the young adults, an exhortation by Father John Gordon, and prayers over individuals. It was a spiritually recharging weekend that everybody walked away from with a new understanding of Jesus Christ in their lives. Overall, this weekend had a powerful and unifying impact on the communities that attended, and all hope that this is a tradition that continues! The Catholic Student Association (CSA) at Rutgers puts on a student-led retreat each semester. These retreats are prime avenues for promoting and enabling student leaders as well as creating large scale environments for the entire community to encounter God. The student leaders began planning this retreat at the end of last Spring Semester, and discerned a theme that really resonated with the retreatants. The theme was “Take Heart: Courage to Be Known”. The two scriptures that really drove the weekend were John 16:33, “In this world you will have trouble, but take heart, I have conquered the world,” and the story of Jesus walking on the water and calling Peter out of the boat from Matthew 14:22. This was a pertinent theme because of the trials that college students today deal with.These range from pressures of the society and school to the fear of the unknown future that so often surfaces throughout this exciting, but challenging stage of life. Loneliness is an obstacle that this generation of college students faces every day. With the rise of social media and other ways of ‘connecting’ it has become easier to put on a façade of happiness, when in reality there is a deeper longing for community and connection, placed in the human heart by the Lord himself, that goes unfulfilled. The idea behind this retreat theme was to present to these students a community and a person, Jesus, who can break those barriers down and fill us with true joy and freedom if they are willing to take courage and take a step off the boat when Jesus calls. Those who attended the retreat were encouraged through talks and small groups to have courage to open the door, step out of the boat, and be known by Jesus through vulnerability and receiving love, as well as through the peers that surround them in the CSA community. The retreat provided a great environment for all of those things, being away from the city and at a beautiful camp, disconnected from cell phones and homework, and surrounded by great people who are open and excited about new friendships. The final talk on the retreat was about how to take all that the students learned and experienced on retreat back to Rutgers, especially through prayer, community, and mission. The students were encouraged not to let the fire go out, and given concrete ways to make resolutions based on what God had worked in their lives, and of course reminded of the community that had surrounded them all weekend, which is a great place to continue to grow alongside one another. The school year is now in full swing and the 2017-2018 Missionary Corps (made up of Missionaries and student leaders) have been working hard to reach as many new students as possible. In New Jersey, at both Seton Hall University and Rutgers University, the first few opening weeks of school are dedicated to an intense season of “reach” - a time in the mission when the goal is to meet as many students as possible in hopes that they come to know Christ through the SPO community. Every year the SPO New Jersey chapter hosts a Benefit Banquet, giving the opportunity for students and missionaries to meet current and potential supporters of Saint Paul’s Outreach. This year, on the evening of April 25th, missionaries, partners, and new friends gathered at Nanina’s in the Park in Belleville, NJ. On April 7-8, Saint Paul’s Outreach teamed up with the People of Hope Formation District young adults and put on a camping and climbing trip in the Shawangunk Mountains in upstate New York. The Saint Paul's Outreach Men’s Household is the best place for a man to live during his time of college. There, I said it. No holds barred. If Household could speak, it would say enthusiastically on behalf of each man, “My life is not my own.” Here at Rutgers University, the Household men are on a mission. From hosting parties for over 100 people, to sharing a family style dinner with a few new guests, to taking a fellow student on a Sunday hike, we walk the same mission - to invite people into a relationship with us and with Jesus Christ. The Men’s Household at Rutgers has been in the running for three years, and we been fortunate to inherit the faithfulness of the men who have lived in the Households before us. This year’s Household has decided to build further upon this faithful foundation. From making a man cave out of our living room (ping pong table and all), to learning how to make some mean breakfasts using a cast-iron skillet, the men of Household have created a refuge of brotherhood which is life giving for both ourselves and all of the guests who walk into our home. Household has become the place where men want to be, a place where men can live out their faith freely, and a place where they don’t have to worry about looking perfect or overly-pious. Men can truly be themselves here. What we have in Household is the best way of life that can be lived on the campus; one in which we are brothers together, on a mission for the Gospel and laying down our lives in service so that others may truly live. The men in Household are not just the future leaders of the Church. They are not just the future fathers of our families, not just the future pastors of our parishes, not just the future owners of our businesses. They are not just the Church of the future. They are the Church, now. I believe with great hope that the men of Household at Rutgers University and the Households across the country will renew the faith from cafeteria-Catholicism to an intentional Catholic way of living, integrating faith into everything we do. Thanks be to God! The Men of Rutgers University foster brotherhood on campus through Men's Nights.